You all know how much I love working out with my kids! 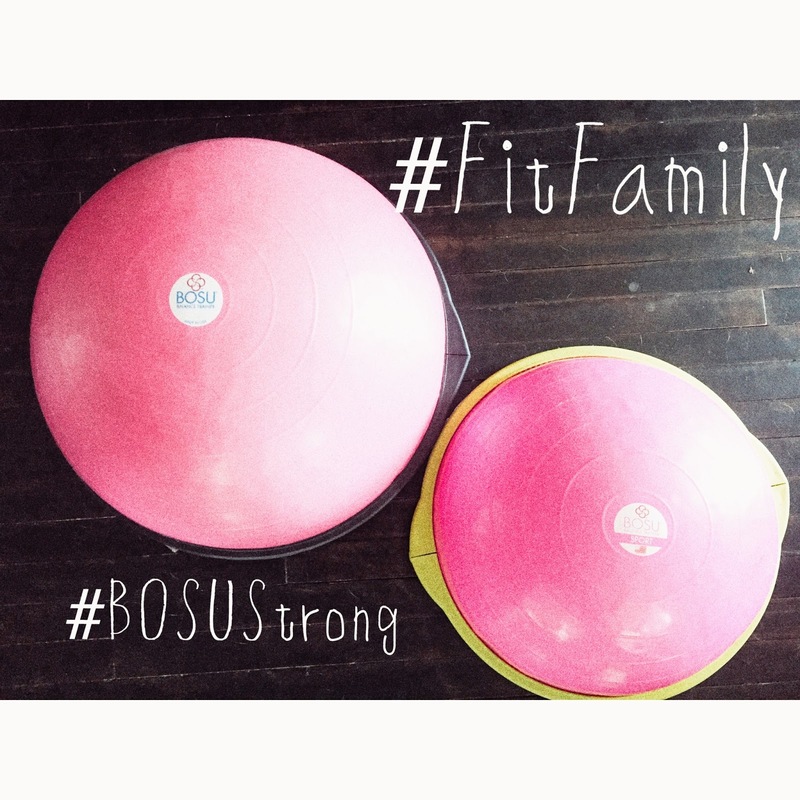 This week is Sweat Pink and BOSU are teaming up for a week of #FitFamily BOSU fitness fun, starting on 10/12 and ending on 10/16! For the last four weeks, the Sweat Pink community teamed up with BOSU to show the world what it means to be #BOSUStrong. One thing that makes me BOSUStrong is my family because they inspire me to keep moving. And I hope to inspire them to do the same. Izzy, Tucker, Ward and I love to jump on the trampoline together! We are constantly on the go during the week days, and take advantage of the weekends to play together! I introduced Izzy to yoga and love watching Tucker play soccer. Any time we jump together, Izzy amazes me! A family that plays together, sticks together! Our favorite #FitFamily BOSU workout is running on the BOSU because Izzy smiles the entire time! And I am loving the BOSU Sport and the BOSU Sport-Kids DVD because its a great workout for my kid and has helped with their balance. To participate in the challenge - play along with the daily prompts below! You can join the challenge whether or not you have a BOSU and we hope you do because its going to be tons of fun and you’ll have a chance to win amazing prizes! Answer the daily prompts on your blog, Instagram, Twitter or wherever else you want to share and hashtag #BosuStrong #FitFamily #sweatpink and tag @BOSU_Fitness (Instagram) @BOSUFitness (Twitter) & @FitApproach – the most active & engaged participants will have a chance to win great prizes from BOSU & Sweat Pink! Hint, hint, the more you share (and the more places you share), the better your chances of winning! *Notes: BOSU wants to remind all participants that standing on a BOSU with the dome facing down is not proper form and therefore any images or content using the BOSU in that way will not be shared. Please also remember to wear shoes when working out on your BOSU to avoid slipping or injury. Also, BOSU kindly asks that all participants share images and content on Twitter that is NOT simply a link from your Instagram accounts. If you do so, they are more likely to share and engage with you – and will get you more points towards winning prizes! Lastly, anyone is welcome to participate in this challenge and we strongly encourage all participants to encourage readers, family and friends to join in on the fun! You do not need to own a BOSU to participate (but you will have a chance to win one!). Disclaimer: This post was sponsored by BOSU. We truly appreciate all of the brands that support the Sweat Pink community.